Today only, you can save 30% at GAP, Old Navy, and Banana Republic online when you enter the code 24HOURS at checkout. It's rare that this family of stores offers a code good for all three, which makes this a super opportunity to find some great deals that can easily add up for free shipping. If you're new to shopping online at these stores, you can jump from store to store quickly by using the buttons located at the top left-hand side of any page. Simply add items to your shopping bag, and everything will be included together when you're ready to check out. 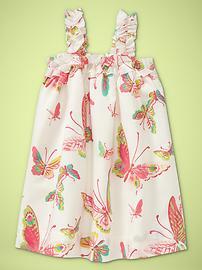 You can get this adorable little girl's dress for as low as $12.60 at GAP, plus so much more!